Some things in the garden need to be planned out in advance while others happen by chance. For instance, this year when our spring rains stopped dead in their tracks I gave up adding any more acidifier to my hydrangeas. 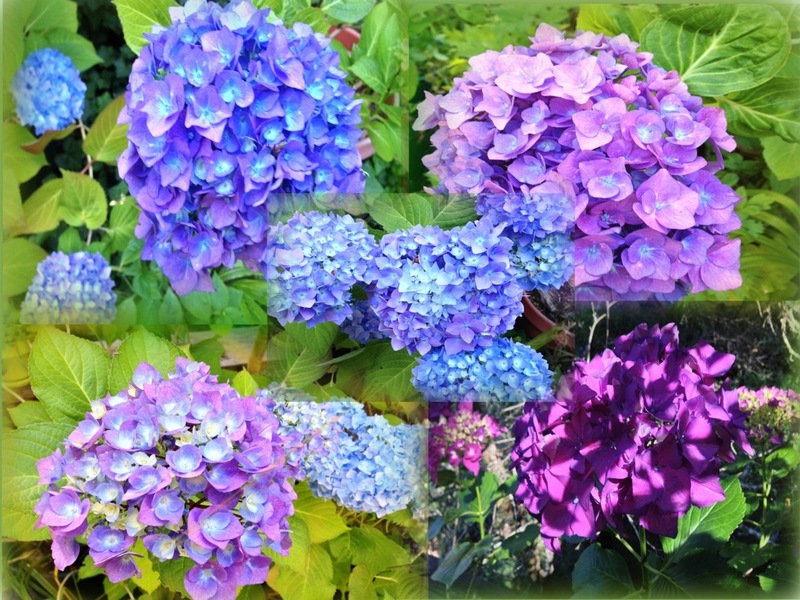 You need to change the pH of the soil around hydrangeas well before they set buds. I like mother nature to water for me early in the season and she didn't cooperate. As luck would have it, the flowers this year are majestic purple, mauve and magenta where before they were sky blue. Frankly, I'm thrilled with this years color palette. Hooray for serendipity. Early summer is the right time, however, for many other garden activities that you don't want to leave to chance. Many plants, both vegetable and ornamental, are bothered by aphids and other sucking insects as well as foliage and flower eating bugs. From cucumber beetles, flea beetles, stink bugs, weevils, curculios to borers , the list of trouble makers is endless. . To help deter them mix up some pepper spray in your kitchen. If your fruit trees are starting to produce too heavily, remove excess immature fruits. Doing so allows remaining fruit more room to grow and prevents branches from breaking under the weight. When apples, pears and stone fruits such as apricots, nectarines, peaches and plums reach 1/2' in diameter, pick some off, leaving the remaining fruits spaces 6-10" apart along the branch. Later, to protect your ripening fruit, enclose the tree with bird netting, hang strips of mylar flash tape near brach tips or substitute old CD's. If you battle dandelions and don't want to use chemical weed killers around pets and children, get out the white vinegar from the cupboard. On a hot sunny day spray straight white vinegar directly on the weed. This method will kill whatever it touches so direct the spray carefully. If the dandelion is in the lawn, wait a week, pour some water on the dead spot to dilute any lasting effects of the vinegar. Then poke a bunch a holes and drop in some grass seed. Sprinkle a bit of fertilizer where the seed is planted and keep the area moist. In three weeks you won't remember where the dead spot was and the dandelion will be long gone. Another garden to-do this month includes summer pruning of wisteria. To increase flowering next spring and keep these vines under control cut new growth back to within 6" of the main branch. If you want to extend the height or length of the vine, select some of the new streamer-like stems and tie them to a support in the direction you wish to train the plant. To encourage continued bloom on annuals, perennials and shrubs, remove faded flowers before they start to form seeds. Make sure you remove the entire flower head and the base where seeds form ( such as the bulbous part of dahlia, petunia or fuchsia flowers) and not just the petals. Cut the stem down to where leaves start. 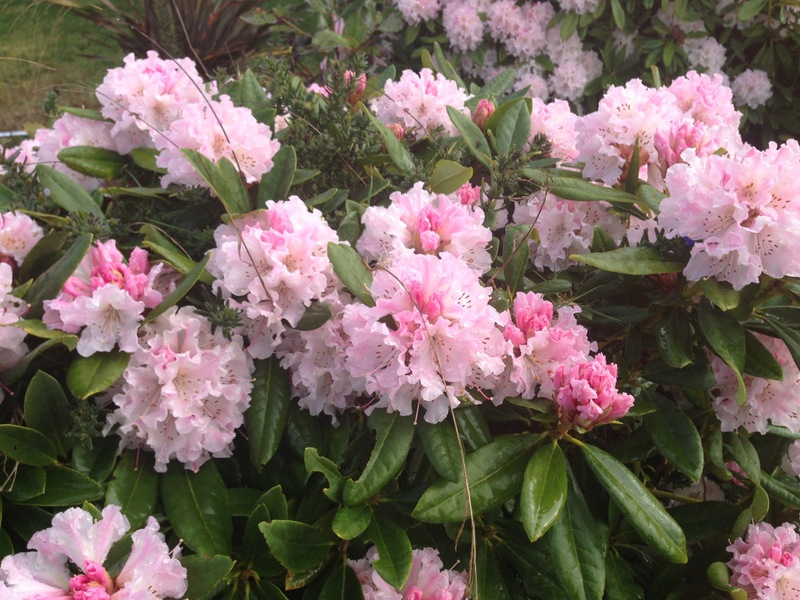 The season has just started and you'll be enjoying lots more flowers in the months to come if you deadhead regularly. 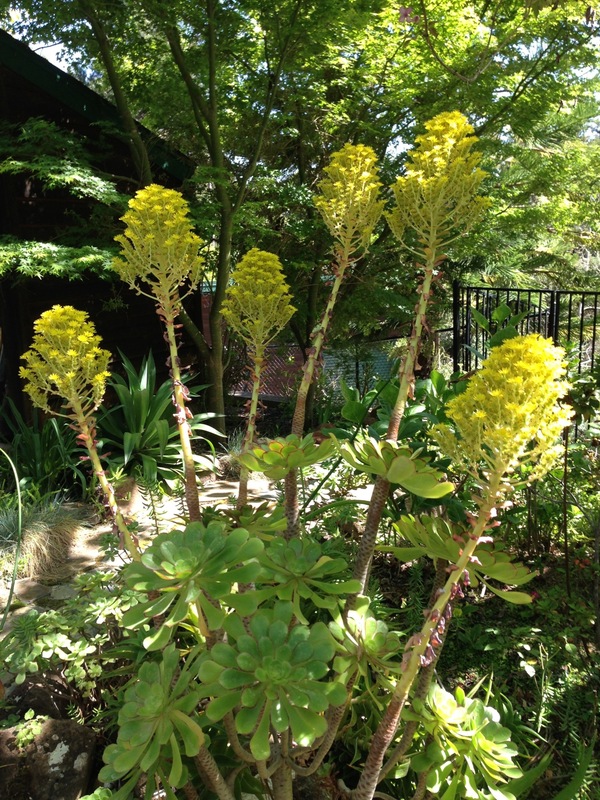 Another maintenance tip is to shear spring blooming perennials to keep them full and compact. Candytuft, phlox subulata, aubrieta and other low growing perennials benefit if you cut off spent bloom and an inch or two of growth. Other perennials and shrubs that benefit from the same treatment to keep them compact are erysimum, lavender and Pink breath of heaven. Also re-apply mulch if it's getting thin in spots. Check ties on trees to make sure they aren't cutting into the bark. Cultivate lightly around trees to discourage weeds and allow water to penetrate. Don't be afraid to move a plant that is not working where its growing now. Make a note in your journal reminding yourself to transplant it sometime in the fall. Gardening is a dynamic and fluid process. Enjoy piecing together pieces of the puzzle. You know spring is coming when you see daffodils starting to open. You know spring is coming when plum trees begin their glorious show. And you know spring is coming when you begin to think of all those garden tasks that still need your attention. February is one of those months that ease us into the gardening season. Didn't get the roses pruned at the end of January? There's still time. Didn't dormant spray for fungal diseases and insect control? There's still time. Didn't plant any new berries yet for summer desserts? There's still time – but don't delay much longer. What is important to do in the garden in February? Prune fruit trees and smother overwintering eggs and insects by spraying with horticultural oil. Combine your spray with lime-sulfur ( except on apricot trees ) or copper soap to kill fungal disease spores like the ones that cause peach-leaf curl. Spinosad has also been shown to supress fungal diseases. Do this when the buds swell but before they open. Prune your roses if you haven't already. Prune repeat flowering roses by removing spindly or diseased shoots and dead wood. Do this before they start leafing out which wastes plant energy. Cut back the remaining stems by about a third, cutting canes at a 45-degree angle just above an outward facing bud. Don't worry whether your pruning job is perfect. Roses are super forgiving and you can trim them up again later. You want to produce lots of roses not just a few of exhibition size. Aim for a vase-shaped bush with an open center. If any old leaves still cling to the plant, remove them. 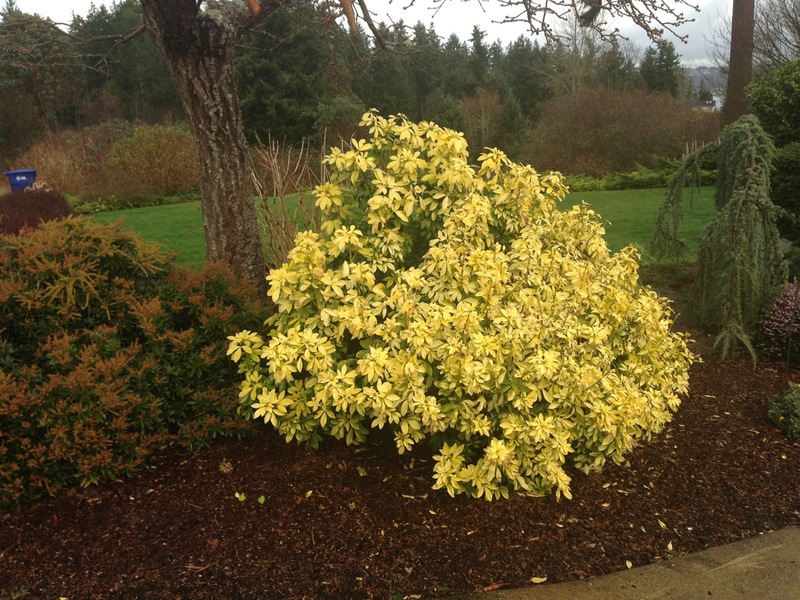 Rake up any debris beneath the plant and discard to eliminate overwintering fungus spores. It's a good idea to spray both the bare plant and the surrounding soil with a combination organic horticultural oil to smother overwintering insect eggs and a dormant spray like lime-sulfur or copper soap to kill fungus spores. If you usually have a problem only with black spot you can use a mixture of 1 teaspoon baking soda with a few drops of light oil in 1 quart water and spraying every 7 to 10 days. Thoroughly coat the trunk, branches and twigs. Cut back woody shrubs. 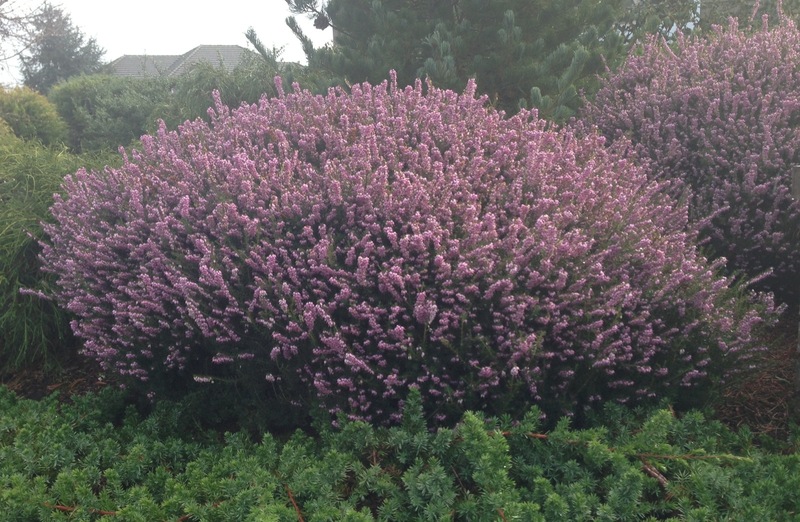 To stimulate lush new growth on plants like Mexican bush sage and artemisia to within a few inches of the ground. Don't use this approach on lavender or ceanothus, though. 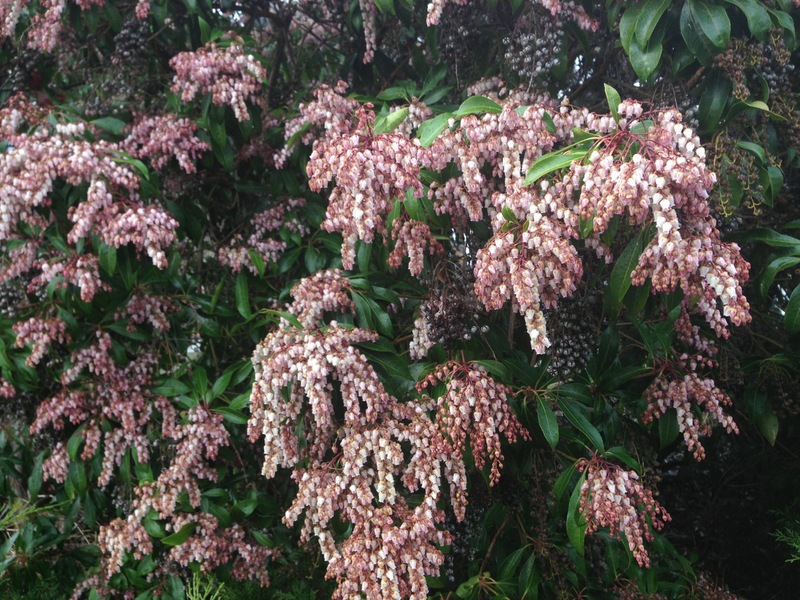 Lightly prune them after blooming and don't cut back to bare wood inside the plant. Prune fuchsias back by a third and remove dead, crossing branches and interior twiggy growth. Container fuchsias can be cut back to the pot rim. 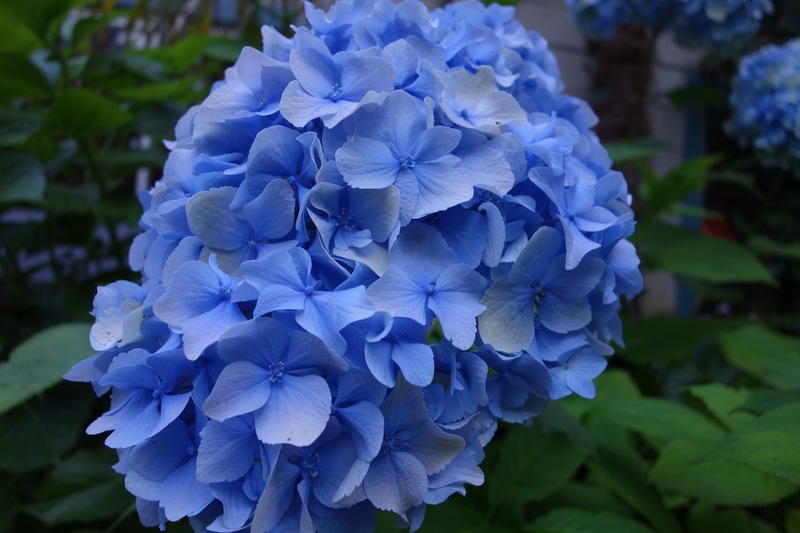 Cut back hydrangeas stems that bloomed last year if you haven't already done so and apply a soil acidifier if you want the flowers blue. Although sulfur is the traditional favorite for quickly acidifying soil it is not as kind to many beneficial soil microorganisms. Coffee grounds, pine needles, peat moss and cottonseed meal are kinder to your soil. Don't cut back grasses yet if you get frost in the area where they grow. Wait until mid-March. 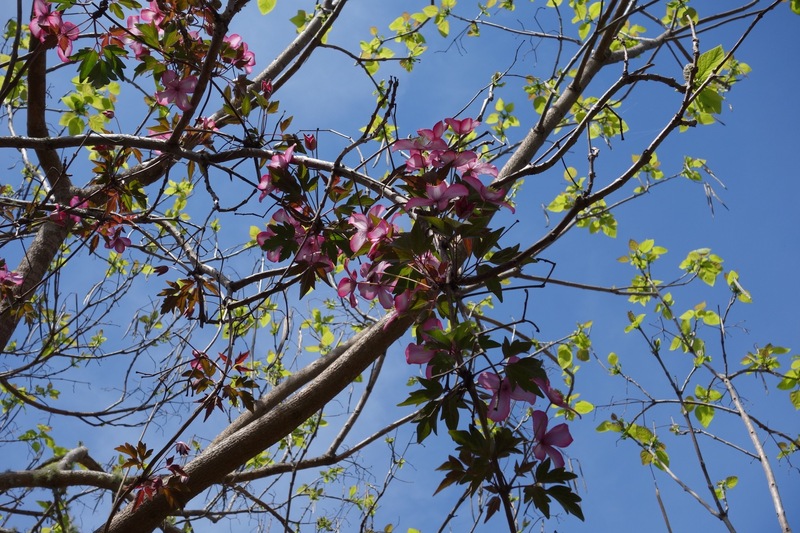 Don't prune spring flowering shrubs and trees like lilacs, flowering cherries, plums and crabapples, rhododendrons, azaleas, camellias, weigela or spirea until after they flower. You can cut some branches during flowering to bring in cuttings for bouquets. Wait to prune back perennials that may have their new foliage damaged in a late frost. Same goes for shrubs that got hit by those January frosts. That damaged foliage can protect the plant from further frost damage. Mid-March is the estimated date of hard frost in our area. Ahbkazi Garden – Victoria, BC. How many beautiful gardens can one visit on one vacation? I spent a whole day at the spectacular Butchart Gardens on Vancouver Island. a couple of hours at St. Ann's Academy heritage garden and the lovely Empress Hotel rose garden is a nice place to watch the sunset over the harbor. 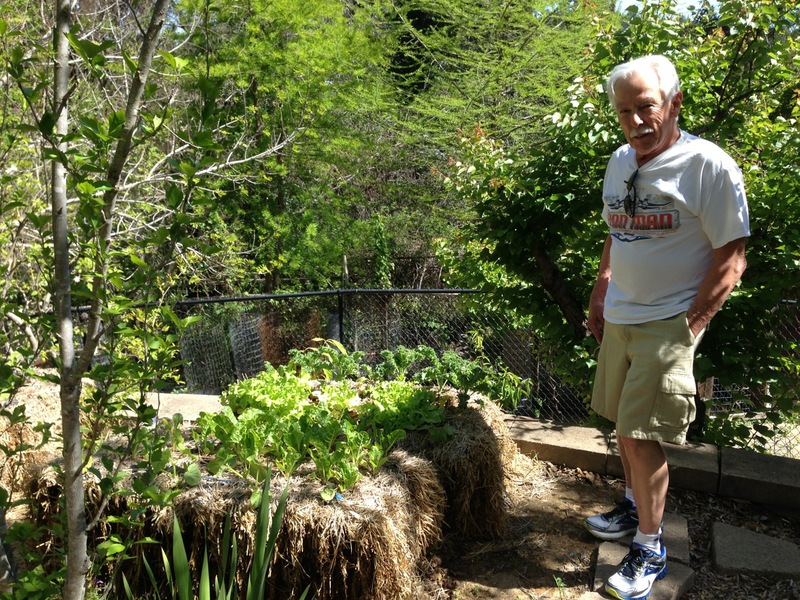 But I wanted more and on the outskirts of Victoria in a residential neighborhood I found the perfect garden. Smaller and more intimate, Abkhazi Garden offers a fine example of what you can do with a large lot full of rocks and trees if you put your mind to it. Now owned by The Land Conservancy of British Columbia, the property was bought in 1946 by Peggy Pemberton Carter who recognized the possibilities on this last undeveloped lot in the neighborhood. This independent minded woman traveled to the west coast after WW II from a prisoner of war camp in Georgia, using funds she had hidden during the war in talcum powder. She married Prince Abkhazi, a Russian fellow prisoner, when he joined her in Victoria and they began to build the summer house and lay out the garden together. Over the next 40 years, Prince and Princess Abkhazi designed, planted and maintained the property. Peggy had lived in Shanghai before the war and it was this influence that plays out in the garden. Chinese gardens are essentially places of meditation, places to withdraw from worldly cares. This must have been very appealing to the Abkhazi's after their experiences in prisoner of war camps. Nothing in a Chinese garden is hurried or blatant. Paths are not just a way of getting from one point to another, instead they are a way of exploring changing views that slowly shift as you walk through the garden. As I made my way between massive glaciated rock outcroppings and under mature native Garry oak trees gorgeous views of the snow-covered Olympic mountains and the Straight of San Juan de Fuca could be seen. Each garden "room" utilizes the natural lay of the land and has a welcoming bench for sitting and taking in the flowers. Lots of birds and butterflies were busy feeding and going about their daily activities. Purple allium flowers the size of grapefruit caught my attention. Growing nearby, pale yellow Candelabra primula[/caption]Japanese iris bordered one of the paths. Fragrant dianthus, several varieties of campanula and euphorbia, lady's mantle and candelabra primula were all blooming and the weeping Crimson Queen Japanese maples were pruned to perfection. More than just a collection of plants, this garden flows with the natural contours and blends the house with it's surroundings. it is a stunning example of West Coast design. 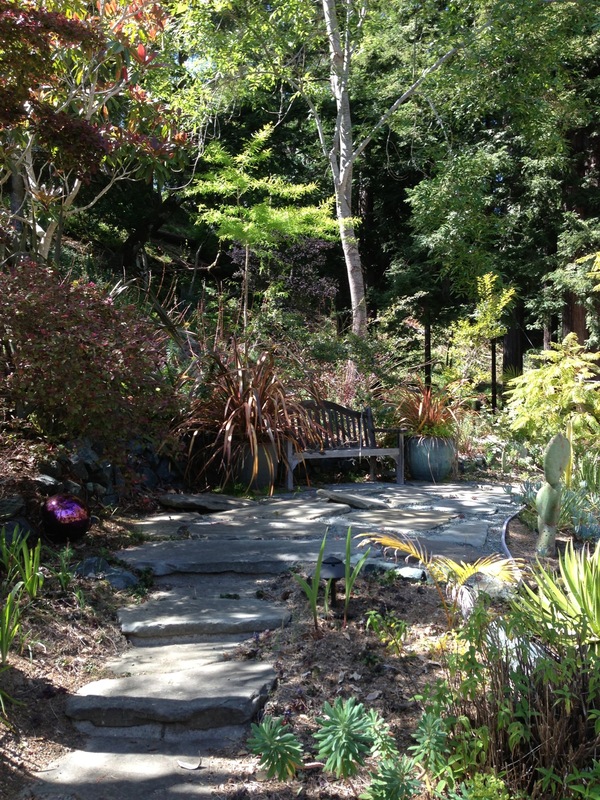 The garden flows around the rock outcroppings, taking advantage of deeper pockets of soil for conifers, Japanese maples and rhododendrons. The original Lily-of-the-Valley beds still carpet a slope. Alpine plants are placed like little jewels around the boulders and woodland plants border the undulating lawns. A small waterfall flows into a pond where 2 large turtles sunned themselves on the rock edge while a third rested on a waterlily pad, it's red ear markings picking up the dark pink color of the waterlily flower. A stand of stately white calla lilies emerged through a piece of drifwood near a resting spot. The garden is magical. 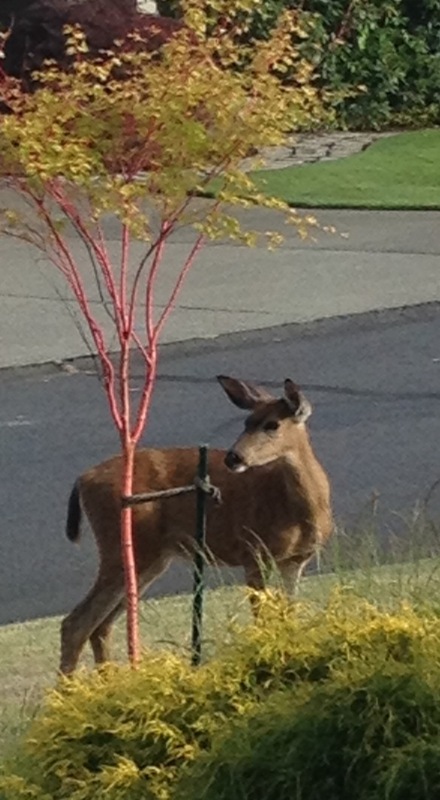 One that you could imagine on your own property if you had the next 40 years to plant and maintain it. is truly a place of wonder. a place to meditate and to withdraw from worldly cares.